– Freezing peas — One of the earliest tasks; as with tomatoes, we can’t imagine not having some stored away year-round. – Strawberry jam — Unless it’s a bad year, we generally try to preserve fruit on a yearly basis for best flavor. If time is short, fresh strawberries can be frozen for canning later. – Pickled garlic scapes — Whenever friends serve these, we vow to make them the next time the scapes are up. – Quick pickled snap peas — Of all of the things we quick-pickled last summer, the snap peas were by far our favorite. – Quick sour pickles — Last summer’s lab on pickling introduced us to these; be sure to serve cold for maximum snap. – Canned tomato sauce and paste — There was a year when there were no tomatoes because of Late Blight, and now we can tomatoes in two-year cycles to ensure we’re stocked. We’ve still plenty of jars of crushed and whole tomatoes, and catsup; we’re out of tomato sauce, and tomato paste is low. – Sweet pickled cherry tomatoes — For when the freezer’s already stuffed full of the season’s roasted cherry tomatoes, this pickled version’s a nice alternative. We tried these initially last year, and they were the first of our pickle stores to vanish. – Pickled jalapenos — We usually freeze hot peppers whole, but were reminded of how good they are pickled when we had them in a recent lunch. – Lacto-fermented salsa — Another one of our staples, it’s easy to make a jar at a time when tomatoes are in season, and gets better with age. We adjust for spiciness when we’re ready to use a jar, and add some chopped up (defrosted) jalapenos to taste. – Freeze ratatouille — The vegetables for ratatouille (zucchini, eggplant, and peppers) can be frozen on their own, however, we find freezing up batches of ratatouille a more convenient way of preserving them. Using Julia Child’s recipe, the vegetables retain texture and hold their shape, and we discovered it makes for a terrific Pasta al Forno. – Rose hips — The squirrels and chipmunks seem to always get to the rose hips first. Maybe this will be the year we’ll beat them to it, and make roseberry catsup, rose hip leather or rose hip soup. – Vegetable stock — It makes sense to put up some vegetable stock later in the season, when ingredients are readily available and the kitchen’s cooled down. We also have this bouillon earmarked. – Fermented kimchi and sauerkraut — We’ll be ready to replace the couple of jars of these left in the fridge by the time napa and head cabbage reappear at the farmers’ markets. We’ve heard there are varieties of cabbage particularly suited for making sauerkraut, and keep meaning to add napa cabbage to the garden list. 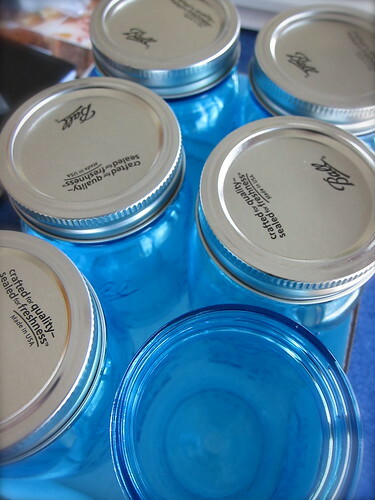 • How Much Canning Do You Need for a Full Year? This entry was posted in cooking, garden, preserving and tagged canning, fermentation, freezing, mastering food preservation, pickling. Bookmark the permalink. I love your list. I have made some goals for my garden this year, too. I will have to try the fermented salsa. The recipe sounds divine. It’s one of our favorite fermented foods, hope you get the chance to try it out! I’ve never pickled snap peas but that sounds really good! I’ll have to try making some if I have a good harvest this year. I’d like to try a lacto-fermented salsa too. I need to make a list like this for this summer! Once it gets started, the season goes by so fast… so many things we’ve already missed! Shared on FB – and still wondering if I’ll have a garden – soil and sun problems and no community garden leaves me staring at my one raised bed and many, many clay pots. Where there’s a will:) Thanks for the nudge! I’ve seen some terrific things grown in containers, and there’s always the farmers’ market! Good ideas. Years ago when we lived in England we lived not far from a pea factory. You could buy them by the bucketful and freeze them. Mind you the kitchen smelled like peas for a few days. Great list thank you! To this I will add: Freeze some basil pesto (don’t add the cheese until serving,) and dried plum tomatoes that we dehydrate. We definitely make sure to stash some basil as well as garlic scape pesto! Great post, a lot of ideas. I will be trying the quick pickled snap peas and the lacto-fermented salsa. I don’t do much freezing but this year I plan to buy a dehydrator to make harvest season last a little longer. I like having a dehydrator but find I don’t cook with dried foods that as often… will have to work on changing my mindset! Such an interesting and varied list of preserves. I tend to stick to just the basics – canned, frozen, and dried tomatoes, dried peppers, and a few frozen vegetables. Very inspiring! Wow, that’s some plan! I will ask my friend master preserver about pickled garlic scapes. When they are available at the farmers’ market, I tend to consume them right away, rather mindless of the future. The scapes will also store in the fridge for quite a long time! There’s a lot of great info in this post, thanks. Last summer I tried quick pickling okra with hot peppers. It worked really well. The hot pickling sauce, heated to dissolve the sugars and salts, cooked the okra just enough to give it the right texture and the hot peppers gave it some heat. This year I want to hot pickle okra because I’m growing a lot more and will need to store it. That sounds like a tasty way to preserve as well as eat okra! Wow! That is a lot of things to preserve. Your winter meals are sure to be great will all of that stored up! Glad I found this post, I too am working on growing, putting up, or finding local producers for all of our foods. It’s a commitment and a learning process for sure!